Writing Built Environment Dissertations and Projects will help you to write a good dissertation or project by giving you a good understanding of what should be included, and showing you how to use data collection and analysis tools in the course of your research. 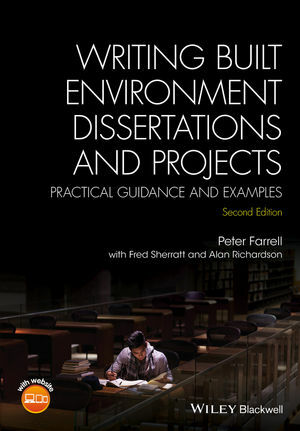 Peter Farrell is a Reader in Construction Management at the University of Bolton, UK, and programme leader for the universitys MSc in Construction Project Management. Fred Sherratt is a Senior Lecturer in Construction Management at Anglia Ruskin University, UK. Alan Richardson is a Reader in Civil Engineering at Northumbria University, UK and programme leader for the BEng in Civil Engineering.